Comfort to carry you through a training session or a day out and about, just like the Jeep brand they are named for, these Jeep Cushioned Cotton Ankle Socks are both durable and good looking. 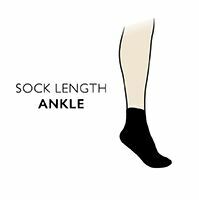 The socks, available in a triple pack of mixed colours, have comfortable terry pile cushioning from the back of the heels and over the toes, with fine mesh air channels along their length and mesh panel tops to keep feet cool. These short, Jeep Cushioned Cotton Ankle Socks are constructed with ribbed deep cuffs, standard toes and elasticated arch supports to help keep them in place and hold the foot stable.